A couple of weeks ago my partner Gesine came back from an NVC discussion evening. Compassion had been one of the topics. Gesine told me that one woman talked about a conflict with her daughter. The woman was very sad about it, especially as she wanted to model to her daughter a different way of dealing with conflict. She wanted to bring more compassion into the world. The conversation had got Gesine wondering: what is compassion, and how is it different from empathy? Sometimes empathy and compassion appear to be almost identical. 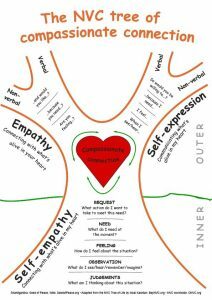 The Tree of Compassionate Connection (pictured) illustrates the differences. 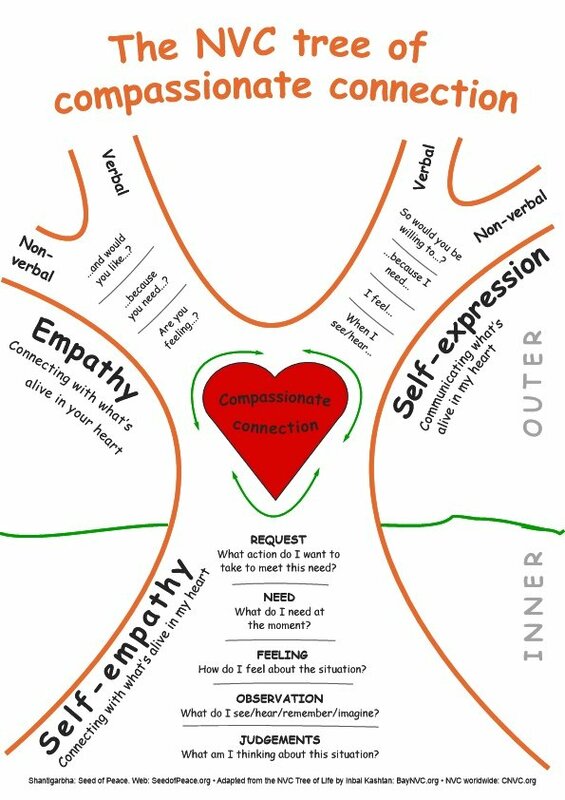 The tree symbolizes the big picture of Nonviolent Communication. At the heartwood of the tree is the intention to create the quality of connection that will lead to everyone’s needs being met. This quality of connection is compassionate inasmuch as it includes everyone’s welfare. Compassion is based on the understanding that we are all deeply interconnected. Because of this interconnection, it’s not possible for one person to meet their needs at the expense of those around them. In other words, nobody’s needs get met unless everybody’s needs get met. Compassion is also unconditional. It doesn’t pick and choose its objects. It extends towards all sentient beings, simply because they are sentient, like us. Empathy appears on the left branches, as we reach out to others in order to understand what is in their hearts. As you can see from the tree, it’s not the only way to embody our compassionate intention. There is also self-empathy (in the roots), and self-expression (in the right-hand branches). Self-empathy is our connection to ourselves, our bodies and the Earth. It enables us to be grounded and present, whatever we are feeling and needing at the moment. Self-expression is when we express what is in our heart to the other person – this is also a way of creating compassionate connection. So compassion is unconditional and has all beings as its object. By contrast, empathy tends to be selective. We tend to empathize more with people we feel similar to. It’s only when we open up our empathy towards all sentient beings that it becomes compassion. There’s one other difference: empathy is essentially a reflective faculty, whereas compassion includes the possibility of action. In other words, empathy is the reflective aspect of compassion; and compassion is the active aspect of empathy. Taken from Shantigarbha’s forthcoming book I’ll Meet You There: A Practical Guide to Empathy, Mindfulness and Compassion , due out in June 2018. You can order or sponsor the book on the Windhorse Publications website.